In The Untouchables, staring Sean Connery and Kevin Costner, there’s this great[famous] scene between Connery and Costner where they discuss how to bring Capone down. I mean he's really asking, "Where is the line that you won't cross?" This going to be a battle and how far is Costner willing to take it? Is he prepared to lose some of the things at stake, to do all that it will take? Ahhhh, there's so much there! So I think about this scene in terms of my own life experience because it forces me to confront goals, aspirations, desires that I have in the most honest and constructive way possible. I’ve learned to look at things in life that I want and ask myself two questions. What are you prepared to do to get that? What are you NOT PREPARED to do to get that? And I want to start with question #2 because I think that part of the process is most informative and impactful because when we really want something, the question is often NOT about what do we need to do to make it happen, but rather about what we are NOT going to do. Where are our limits and how are those limits going to impact the process and timeline of this journey? It sounds like a negative place to start, but it was the most honest way to carve out the path I would ACTUALLY take to my goal. My life was full of lots of restrictions and I had little energy and time to myself, so I had to be frank about what could happen and was could not. In being honest with myself about my personality, life and life limitations, I easily identified exactly what I was NOT prepared to do to get in shape and start exercising again. It was an effective and insightful exercise because when I was done, I realized that I had few options that could actually work with me and my real life but that was exactly what I needed! I had direction and customized direction at that! Whatever satisfied into this list was going to be nearly perfect for me and then I would just have to focus on consistency and discipline. Well if you work with me currently or follow me on Instagram of Facebook, then you probably know what form of exercise I pursued in light of this list. Living room workouts with kids! I did strength and metabolic conditioning work almost exclusively and then also some walks and sprints. When I first started working out again in my basement gym. 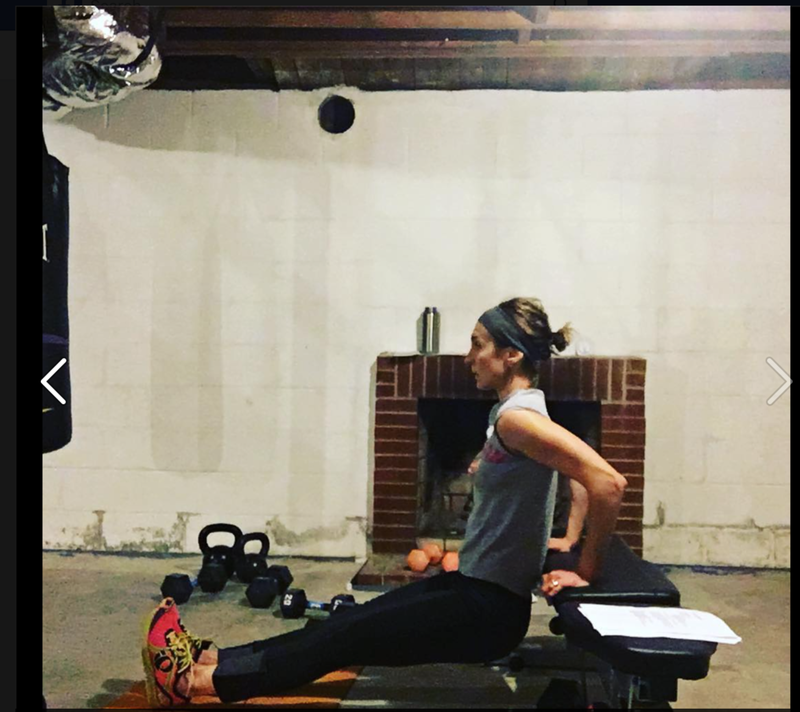 I dug out my old dumbbells and started doing Metabolic Effect circuits,then branched into kettle bells and eventually began creating my own workouts! Enter, THE KETTLEBELL and Baby #3! It all satisfied my list “unwilling to do” list. And because this approach satisfied my list of requirements as defined by my “Unwilling to do” List, then I was able to be consistent and get results. Make sacrifices in the form of entertainment, nap time downtime, etc. I was willing to workout it various times and even be persistent in my exercise for a while until I saw results, but none of this would have mattered if I hadn’t started with my list of “won’ts” and used that to inform my actions. The won’ts were more important because let’s face it, it’s much easier to lie to yourself or just be overly optimistic about what we will do, but honing in on exactly what I was NOT going to do, made this a more effective and honest process. I made all my excuses up front! I identified what was just NOT going to work, so that mostly all that I was left with was what (barring sickness or unplanned life craziness) 100% doable. So here’s my advice to you today. Whatever it is that’s nagging you, that thing is that you know you should be doing, but keep putting off, the one you can never quite make stick, despite good intentions, renewed commitments and all of the resources that you’ve tried…. Ask yourself honestly these two questions about it. What am I willing to do in order to get it? What am I UNWILLING to do in order to get it? Use your answers to number 2 to make your plan. Then do all the things that you’ve listed in question #1 to make your plan work. B. how much less challenging it is to honor your commitment this time around. You’re still going to need discipline, maybe accountability and definitely persistence to push through all the imperfect moments when life simply does NOT align the way that you want it to. BUT THIS TIME, you’ll be following a plan that doesn’t hinge upon you becoming a new and different person, doing things in a way that you WOULD NEVER do things, or jumping through a whole bunch of hoops that let’s be honest, are not you and NOT THINGS that you are PREPARED to do to get what you want.